As many readers will know, I am an enthusiastic advocate of a new way of looking at the economy, something which I call “surplus energy economics” (“SEE”). In support of this, I’ve developed something known as “SEEDS”, or Surplus Energy Economics Data System. With the finishing touches being put to the 2016 version, what I aim to do here is to outline some of its principal conclusions. This will also serve as something of a primer for those not familiar with SEE. SEEDS-16 confirms that, despite a price-war in oil markets and a weakening in demand resulting from economic slowdowns (most significantly in China), the underlying trend in the “energy cost of energy” remains strongly upwards. Energy market surpluses do not change the fundamental point, which is that depletion continues to make replacement sources of fossil fuels increasingly expensive. Rapid expansion in shale output doesn’t change this, because the big weakness with shales is the very rapid rate at which production from individual wells declines. The future clearly lies with renewables (and principally with solar), but, as discussed later, these are unlikely to change the dynamics of an increasingly-costly energy supply mix. What this means is that, after a hiatus, there will be a resumption of “energy sprawl”, meaning that the resource and financial requirements of energy supply will continue to absorb a rising proportion of economic output. This in turn means that the real measure of prosperity – that is, output net of the economic rent attributable to the imperative of energy access – will come under increasing pressure, despite the assumption that economic efficiency will improve. As the first chart shows, the world’s real economy – that is, the economy of goods and services, rather than their “financial economy” proxy – can be expected, first, to stagnate, and then to enter gradual decline. Some of the world’s most vibrant economies, such as India and China, may buck this trend for as much as a decade. With few exceptions, the outlook for the mature developed economies is bleak, with Britain and Japan set to suffer the worst declines, in both cases for quite specific reasons. At the same time, continued expansion in the “financial” economy of money and credit – which have value only as “claims” on the real economy – has created a very dangerous situation. Essentially, the financial economy has created far more claims than the real one can ever satisfy, and SEEDS-16 quantifies these “excess claims” at $67 trillion. Essentially, SEE argues that we need to think in terms of two economies, not one. The first of these – the “real economy” – consists of goods and services, labour and resources. This real economy is a function of energy, not money. After all, money has no intrinsic value, and can be (and has been) created at will, without adding anything to the real output of the goods and services that we need. Energy, as the basis of the real economy, needs to be defined broadly, to include labour and nutrition as well as the more familiar forms of energy such as fossil fuels and renewables. Since it has no intrinsic worth, money possesses value only as a “claim” on the output of the underlying – real – economy. Money, then, has only “claim value”, whilst debt, as a “claim on future money”, is in reality a claim on the future output of the real economy. Together, money and credit comprise the second or “financial” economy. This is the economy of monetary data (such as GDP, incomes, spending and debt) with which everyone is familiar, but in reality it is nothing more than a convenient proxy for the real economy of goods and services. The financial economy, consisting entirely of created claims on real output, can in principle help us to manage the real one to best effect. But an obvious danger exists where we create claims that exceed what the real economy can deliver. Where this happens, the difference is known in SEE as “excess claims”, meaning “financial claims on economic output that the real economy cannot satisfy”. And this is exactly what has happened over the last decade and more. The financial system has created credit (money and debt) at a much faster rate than growth in the real economy. “Excess claims” show up primarily as escalating debt which we know can never be repaid. SEEDS-16 quantifies a global aggregate of “excess claims” of $67 trillion as of the end of 2014. Put simply, these “excess claims” are “value” within the financial system that, one way or another, has to be destroyed, because it cannot be satisfied. This $67 trillion number is not analogous to global debt, which is very much larger (around $200 trillion). Rather, the excess claims figure is indicative of the scale of debt and other claims that cannot be met, and will therefore have to be written-off in one way or another. On this basis, it is a permissible simplification to say that about one-third of all global debt can never be repaid. This creation of “excess claims” has happened for two main reasons. The first is simple recklessness. The second is a miss-match between what the financial system expects the real economy to produce, on the one hand, and, on the other, what the real economy has actually delivered. This “anticipatory error” reflects a tendency to assume that the future will be an extrapolation of the recent past. The trouble with this is that it has been derailed by the disappearance of the rates of economic growth that had become familiar in the past. So the debt colossus that hangs over the world financial system like the Sword of Damocles has resulted both from the excessive creation of debt and from the poor performance of the global economy. Why, then, has the real economy become so weak? That it has indeed weakened is underlined by performance since the 2008 slump. Generally, a recession tends to be followed by catch-up growth, as businesses and households alike carry out spending deferred during the down-turn. This time, however, here has been no such catch-up rebound. The explanation for the weak performance of the global economy lies in the rising trend cost of energy. To understand this, it must be appreciated that energy cannot be accessed at zero cost. Capital and operating expenses, though usually considered as money amounts, need to be assessed in energy terms to make sense of this equation. 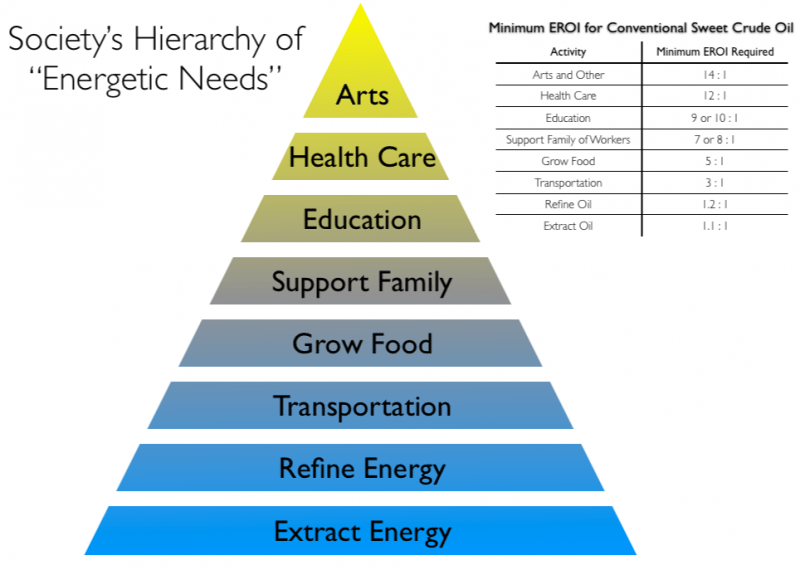 The critical equation here is EROEI, meaning the Energy Return On Energy Invested. An EROEI of 30:1 means that, within 31 units of energy accessed, 1 unit is the energy cost incurred, and the remaining 30 units are available for use. The SEEDS system uses the inverse of EROEI, which is ECOE, or the Energy Cost Of Energy. If the EROEI of a given source is 30:1, the ECOE of that source is 3.2%, which is 1 divided by 31. Like EROEI itself, the ECOE progression is non-linear. If EROEI falls from 60:1 to 30:1, ECOE rises from 1.6% (1/61) to 3.2% (1/31), a relatively small increase in cost for a halving of EROEI. Reduce the EROEI to 15:1, however, and ECOE rises to 6.25% (1/16), a very material increase in cost. At EROEIs of 10:1 and 5:1, ECOE is 9.1% and 16.7%. What this in turn means is that the overall EROEI of the economy can move a long way before its effects become apparent. Critical territory is entered, however, once EROEIs fall below about 15:1. Conceptually, the “energy cost of energy” can be thought of as the economic rent which the resource set imposes on the economy. Historically, unfortunately, it has not be accounted for in this way. Rather, it has tended to be overlooked altogether. Of course, the actual cost of energy in any given year is determined by factors only tangentially linked to underlying trends. Political factors, such as wars, revolutions and OPEC policies can drive prices sharply upwards, as they have on many occasions. Conversely, a slump in activity – and hence in demand – can undermine prices very significantly, particularly if they follow a period in which sustained high energy prices have led to a spike in investment. The latter describes the current situation. Until 2014, growth in demand for energy was pretty robust, and was expected to remain so. High prices encouraged big investment in supply, most notably in the production of oil and gas from shale formations in the United States. At the same time, high prices stimulated investment in renewable energy sources such as wind and solar power. Latterly, with the slowdown in Chinese expansion, the global economy has all but lost what previously had been almost its only engine of growth. This has come as something of a shock to the system, mainly because of a widespread failure to recognise that China, like the West before it, had been delivering growth primarily on the back of enormous incremental borrowing. At the same time, hefty capital investment had resulted in big increases in supply, principally from US shales. What we have now is, to all intents and purposes, a price-war, between US shale producers on the one hand, and, on the other, Saudi Arabia and its fellow Gulf exporters. Both sides are suffering severe financial pain from this price-war. The Gulf countries have experienced drastic falls in their export revenues, which have in turned created enormous fiscal deficits. In the United States, companies specialising in shales have suffered carnage, reporting sharply lower cash flows and profitability, and rapidly increasing debts. Much of this debt is deeply into “junk” territory, and equity value has slumped, all but cutting off the shale sector from access to new capital. This has extremely important implications for the future production outlook. Though the sheer scale of oversupply suggests that the price-war may prove protracted, the tactical weakness of shale lies in rapid depletion rates. It is by no means uncommon for production to decline by as much as 75% in the first year of a shale well’s operation. This means that, to maintain or increase output, operators need to carry out an on-going drilling programme, something that has been likened to a “drilling treadmill”. As a result, the drying up of investment funds is likely to result, relatively quickly, in declines in production. The Gulf producers appear likeliest to win the price-war, though that can be by no means a certainty. Whatever the outcome of the oil price-war, the salient point is that energy prices are extremely volatile, whereas what is needed for purposes of economic analysis is a trend rate of changes in ECOEs. This is shown in the next chart. Between the first oil crisis in 1973 and around 1990, actual energy prices were well ahead of trend. They were again above-trend between 2004 and 2013, but have now fallen back to below-trend levels. We need to be very well aware that the current weakness in prices is caused in large part by the price-war, so we most certainly can not assume that we have moved back into an era of cheap energy. Starting with oil, the cost of developing and producing new sources of oil has risen relentlessly for at least two decades, and arguably even longer. The world’s biggest, most cost-effective fields were developed first, and the fields which replace them are ever smaller, ever more remote and ever more costly to produce. It has, indeed, been argued that the production of conventional oil peaked in 2005, and that subsequent net increases in supply have come from unconventional sources (which may be why influential publications now talk about “liquids” rather than “oil”). The most important unconventional source of liquids is shale, but this suffers from very rapid rates of depletion. High investment can cope with this, of course, but not if returns diminish because the best locations have – quite logically – been used first. Though conventional natural gas has yet to peak, gas is otherwise in much the same situation as oil, with the most cost-effective fields already depleted, and costs rising as ever more marginal resources are developed. Reserves of coal are relatively abundant, but the calorific value of the production slate is declining, because the best coal (such as anthracite) has been extracted first. Furthermore, environmental considerations strongly militate against expanded use of coal, something which might be difficult to do anyway, given the decline in calorific content. The role of nuclear will clearly increase, but nuclear fuel supplies are by no means abundant, and dealing with spent fuels remains extremely difficult. What all of this means is that renewables will account for a rising share of the energy slate in the future. This said, renewables only accounted for about 2.5% of primary energy supply last year, and increasing this proportion will be expensive. Within the mix of renewables, the most promising (by a very wide margin) is solar power. The track-record of wind-power is somewhat mixed, and its economics seem to rely on heroic assumptions for the longevity of plant. Biofuels are of limited scope, not least because a lot of liquid energy is used up in planting, harvesting, processing and distribution. Moreover, a big increase in biofuels output would pose a clear threat to food production, a critical issue which may already be at serious risk due to water depletion, the declining nutrient content of land, the high (energy) cost of inputs, and the implications of climate change. There are two other points to note about renewables. First, and before the outbreak of the oil price-war, the best renewables (principally solar) had showed that they can compete reasonably well with fossil fuels in price terms. But their pricing, and their cost-effectiveness, only looks solid when they are compared with the oil and gas production mix of today, and more specifically with the high-cost sources that are increasingly being accessed. To put it another way, renewables may be able to compete with an oil and gas slate whose costs have already risen sharply, but they cannot replace the world’s rapidly-dwindling (but still significant) legacy of large, long-established and very low-cost fields. Second, renewables cannot match the energy density – the quantity of calories-per-kilo – offered by fossil fuels, especially oil. Propelling a Boeing 747 with electricity is not remotely possible today and, despite rapid progress in battery technology, may be prevented by the laws of physics from ever becoming possible. Though the day-to-day relationship is subject to huge volatility, the underlying trend in the ECOE – the energy cost of energy – is emphatically an upwards one. Even with a price war in full swing, the “economic rent” which energy imposes on the economy remains far higher today than it was ten years ago. Though it may take several years to happen, the likelihood is that energy prices will in due course move back into higher territory, partly in response to big cuts in capital investment. This is to some extent a cyclical phenomenon, but the cycles behave in sine-wave formation around a secularly-rising trend. 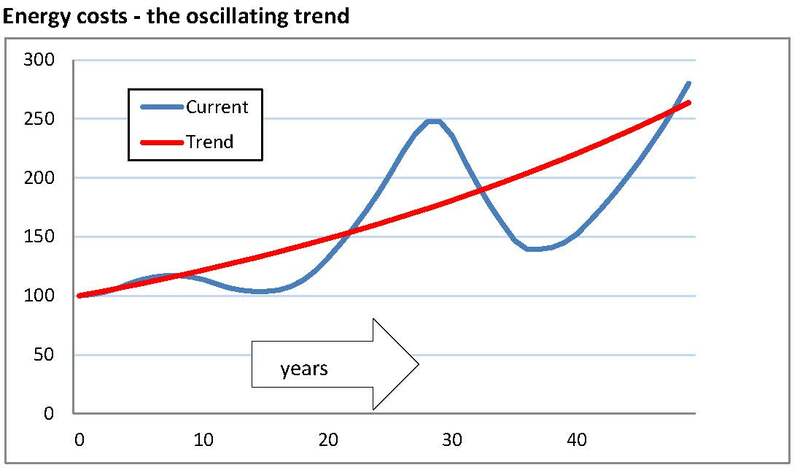 This is termed the “oscillating trend”, and is shown conceptually in the next chart. The secular rise in trend energy costs is already taking its toll on the real economy. The energy cost drain has resulted in escalating indebtedness, because the world has gone on acting as if the “economic rent” exacted by the energy resource set does not exist. The cost of household essentials has soared, undermining discretionary spending capacity in ways not measured by conventional calculations of inflation. The weakening real economy has already forced us to cut returns on capital to levels which deter investment. What this really means is the pressure on the real economy is forcing us to prioritise consumption. The next stage of the ECOE squeeze will involve economic deterioration that can no longer be disguised. In future articles, I will look in more detail and how and where this is likely to happen. This entry was posted in Uncategorized by drtimmorgan. Bookmark the permalink. What a great post, thanks Tim. Playing devil’s advocate, the only thing that comes to my mind to counter this is some out of the blue energy innovation that no one can see coming (a huge breakthrough in solar efficiency for example). Unlikely, but possible. No one presumably saw the innovation of getting oil out of the ground coming in the beginning and how it would change the world. Not sure what that would mean for the debt though? My view is that technological progress will doubtless continue. But it is limited by the laws of physics. The example I use is maritime radar. The electronic bits get ever smaller, but the physical parts – the size of the scanner and the height of the mast – cannot be miniaturised, in fact keep getting bigger. Also, I’m optimistic on solar, again so long as its limitations are recognised. It may enable us to stabilise an economy that we can live with – but it will not take us back to an age of energy “too cheap to meter”. In the past, when energy was so abundant, economists could safely ignore its economic rent, assuming simply that “demand will produce supply”. Those days aren’t coming back. Climate change seems to point in the same direction, i.e. sustainability may be possible, but consumerism cannot be a part of it. As for debt, what cannot be paid will not be paid” – I just hope that we don’t debase the monetary system too far before we find this out. Lastly, we are talking about changes on a scale which, in the past, have never – ever – been accomplished without revolutions. Good post, Tim. I like to refer to the “declining utility of energy” as my yardstick expression. Bill Bonner writes that” All civilizations collapse because they run out of energy” This is where we are inexorably headed since there is no sign of a lessening of the endless growth mentality. It is unlikely to happen voluntarily. any more that population growth will reverse voluntarily. It’s handy to see the stats about ECOE. The issue is way too vast for renewables to achieve any benefit beyond a marginal, local one. As Nate Hagens puts it 90% of the global work force is of carbon co workers. Using the CMO illustration [cubic mile of oil] we burn 1 CMO of petroleum every 300 days [plus nearly 2 more of coal and gas and renewables]. That 1 CMO if converted to say, Hydro, would require 200 dams each the size of China’s Three Gorges Dam. A millisecond of reflection will suffice to see that is not possible. Or the nuclear alternative of 2,600 plants is equally not an option. Just for starters, the resources required to build them, in the face of declining energy utility and other uncertainties [politics etc] would require a large parallel economy to be going on as we still have to fuel the one we are in now. 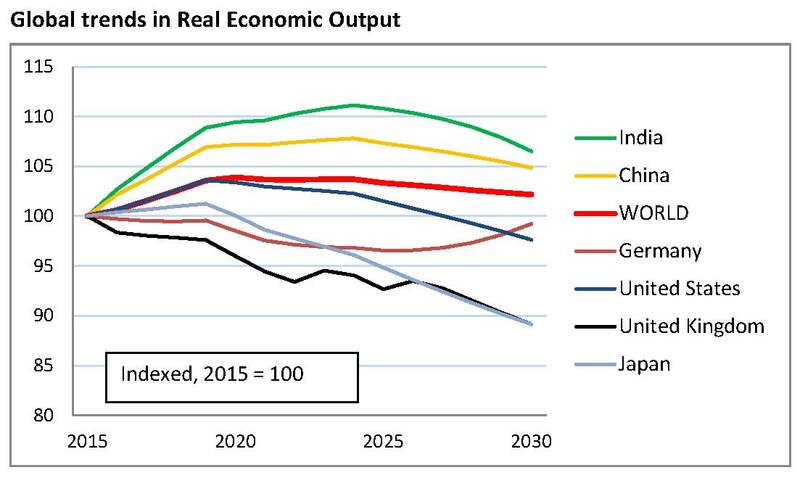 Worst of all the BAU Growth mantra would mean we would have in 20-30 years doubled the energy needs of today. It’s all just a fantasy that no one wants to wake from! Good points as ever, John. Have you read studies which attribute the decline and fall of the (western) Roman Empire to falling EROEI? The population declined by 95% when this happened. The decline in population was manifested in disaffected people escaping to avoid crippling taxes. as much as anything. I like Tainter but he suggests here that “Peak Oil” will be reached in around 2012. Mmmmm. He obviously wasn’t as aware of Fracking as he should have been at that point, even though it had yet to really hit the public consciousness. He undersells innovation in general. I have corresponded with Prof Hall, who is quite brilliant – in fact he discovered and named EROEI/EROI. And of course, do please delete the comments above after you have read them. I dunno I think they’re highly entertaining, I haven’t laughed so much in a long time. I assume it is a wind up? If not I’m not going to reply as the response would go on for pages, I might even have to divide it into chapters. I must be missing something? Thanks, much appreciated. Making changes is tedious here, as one can lose all the formatting, but if I can I’ll update. I’ve refreshed this site a bit – nothing drastic, but my main aim was to spare you all from ads (personally, I really dislike ads, and not everyone has blockers. Great post, Tim. Have been following your blog since I read “Perfect Storm”. There is currently a great crash in commodity prices around the world which I think ties perfectly with your statement: “This “anticipatory error” reflects a tendency to assume that the future will be an extrapolation of the recent past. “. The massive overproduction of commodities emphasizes how prevalent this “anticipatory error” is. Everyone, from Australian mining industries, Chinese construction companies, property companies, etc, expects China to keep the infrastructure development game on, even when there are news of the emergence of “ghost cities” due to the rapid development. 1) Are we going to see another repeat of 2007-2008 with an increase in food prices and unrests around the world? 2) Can the world economy actually afford high energy cost? I have been thinking about question 2 since it’s raised in the recent few posts by Gail Tverberg at ourfiniteworld.com. It does seem likely that there is an interaction between high energy cost and demand. People reacts to high energy cost by cutting energy consumption which could possibly limit how high the energy price could reach. Of course that poses profitability issue for the energy sector, which might lead to less investment in production/exploration, eventually leading to less supply and higher price. The cycle then goes on in a period of protracted recessionary period. What do you think of that possibility? The world has assumed that the Chinese economy is “unstoppable” – just like Japan and the ASEAN tigers were “unstoppable” (and just like TITANIC and BISMARCK were “unsinkable”, come to that). But China has borrowed $21 trn in a period when growth was only $5 trn.This inevitably results in waste – in this case, excess capacity in many areas. We can indeed cut energy consumption because of high prices – a very long time ago I did a study of just this for OPEC. But then you have to look at the mix of GDP – does cutting consumption really mean making less, and just passing more pieces of paper around instead? That way, you can end up as an “intermediation” economy, like the UK today – but there always has to be a basis of “hard”, globally-marketable production, as one cannot live entirely on “doing each others’ laundry”. (If you want to see what happens if you try this, just look at UK dependency on borrowing and asset sales, and ask yourself whether Britain could survive a rise in global rates, before answering this question). Point 2, no, we can’t afford it, as “afford” is conventionally understood. But energy is not just the basis of all goods and services, but is above all the basis of essentials – and we all need shelter, food, warmth, mobility and so on. So what has to be happen is that “discretionary” (wanted-but-not-needed) consumption gets pushed out. I don’t doubt that we’ll try dodging this with debt, monetary manipulation and yet more “intermediation”, but that’s a zero-sum game. So, the question might be, “can we afford not to afford it?” We’re going to have to downsize materially – and that might not be all bad – but it’s going to raise drastic questions about equality, I suspect, as the poor find essentials increasingly unaffordable whilst the rich try to hang on to everything they have. Thank you for another excellent and enlightening article. Many people recognise the inevitability of a “crash event” still blindly ignored by the MSM. For my part, and I imagine many others, the burning question is “when?”. I’m drawn to your comment that a third of global debt cannot be repaid. Can this be proportion of debt be extrapolated forward? When does it become 40%, 50%, 75% – is it another hockey stick graph where we are now in the last minute/second before midnight? At what point does that proportion of debt capsize the iceberg? Would the debt capsize event and the EROIE event be simultaneous – or does one precede and thereby negate the other? We can certainly project forward the amount of debt that cannot be repaid. The number for global “excess claims” accumulation is about $6 trillion annually. Expressing this as a percentage is harder, because we don’t know by how much the total will grow. Debt is taken on for many different reasons – to boost or sustain consumption, to fund public spending above tax income, or to build capacity that nobody needs. The scariest part of the picture is borrowing simply to pay the interest on existing debt. This has been a big factor in the post-2008 acceleration in borrowing. As a bank, you can either accept that a borrower is bust – which means taking a big hit to earnings, the balance sheet and your reserve ratios – or you can lend him enough more money to keep paying the interest, adding this to the total debt. According to Bloomberg, Chinese companies will this year borrow US$ 1.2 trillion just to pay interest on existing debt – a scary idea, I believe. The events may indeed coincide, not something I’ve worked on but a great suggestion. Despite current low energy prices, the cost of building new energy access capacity remains high. Debt may well be used to fund this. A poorer underlying economy is already squeezing out capital investment. How best can I put this? Not every country can ask France or China to build new power plants for them……. Thanks for yet another very interesting post Dr Morgan. Although you joked about 1789 in a comment above I do wonder if this is where we are heading. As we all know the hole we are digging for ourselves keeps getting deeper and gives us less and less ability to get out so one has to ask: how actually do we get out of this? Any answers seem less and less of the variety of ” we can do X (X is any technocratic solution within conventional wisdom) and more and more along “we need a total reset” lines. As you say debt levels have already reached somewhat “irrational” levels and, as you cannot deflate a Ponzi, at some stage there will have to be a correction and, just maybe, 1789 will be the only alternative as I cannot see the elite in society standing by while their ill gotten gains disappear before their very eyes. I studied theory of revolutions at university, a fascinating subject. Political stability does seem to depend on economic stability – as China’s leaders are more aware than most. A revolution seems to rely on the emergence of a new class – restless, assertive and largely rootless. The Tsarist regime was no more brutal in 1917 than, say, 1817, but the emergence of the “proletariat” changed the dynamic (I don’t want to sound like a Marxist, by the way, but the term “proletariat” has stuck). Much the same can be said of 1789, and, again, this seems to have been why the revolution happened then and not, say, 50 years earlier. Also, the French state was bankrupt in 1789, and kept losing wars – there are clear parallels to today. So, is there a new disconnected, rootless group capable of radicalisation? I think there is, in something becoming known as “the precariat” – those people, predominantly young, who live precarious, hand-to-mouth lives, have little material stake in society, and see no prospect of that changing as they get older. A year or so ago, a leading US billionaire warned of “pitchforks” if the rich don’t learn to be less greedy, and pointed out that Henry Ford paid good wages, not just out of altruism but also because he wanted workers to be able to afford cars. Logically, rapid economic growth widens inequalities, but even those at the bottom should at least be getting a bit better off, blunting their discontent. Conversely, if absolute deteriorations in living standards continue, anger is likely to mount, especially if the “precariat” gets bigger. As well as economic numbers, I would watch indicators like temporary vs permanent employment, job turnover and other measures of “precariousness” (such as use of food banks). Tim, I have also been reading your blogs since “A perfect Storm”. Firstly I would like to thank you for sharing your thoughts with us all, I find your ideas very enlightening. I am a bit of a novice and not an expert,so please forgive me if my question is naive, but I was pondering on the thought of Oil prices having hit a temporary ceiling with the advent of Shale drilling, and we are now entering a phase of relative price stability. Are we now in a state where Gulf oil prices are capped by the production costs of shale oil ? After all, there is a cut off where shale is profitable, so if Gulf oil rises above that, then the shale oils well start producing again, when the price drops below, they shut down again. Obviously this is contingent on the infrastructure to produce shale being in place etc. Thanks, and you raise a very valid point here – the chief economist at BP has said much the same, by the way! Opinion is divided over this. Shale op costs have come down a lot, but the issue is capital cost. Shale wells’ output drops very rapidly indeed – a first-year fall of 75% is quite common – so continuous drilling is needed to sustain or increase output. The cost of drilling has decreased, but it remains expensive. Comparing cash flow with capital spending, shale net cash flow has always been negative, even when prices were much higher. The parlous state of shalecos is impairing their access to capital, just as their own cash generation has crashed. With sustained low prices, I believe that drilling will taper off and production will fall. The question raised by BP and others is whether shale can be an on-off source, quite unlike the industry’s normal “mega-projects” which cannot be used in this way. Can output be raised quickly if prices surge? My feeling here is no. First, I don’t see investors in any hurry to repeat their shale experience, and tags like “Saudi America” won’t be convincing this time. Second, knowledge of the resource is already extensive – unlike, say, when the North Sea was first being developed – so the chances are high that the best sites have been used first. Some studies show that there is a small minority of economically-robust sites and a big hinterland that is marginal. This said, we don’t yet know. However, in the background, other oil resources continue to deplete rapidly – we need to replace about 7% of non-OPEC production each year just to stand still – and what little we know about Saudi oil is far from encouraging (for instance, mature fields now require vast water injection to keep pressure up). My hunch would be to see shale a bit like Alaska, not geologically of course, but in terms of time and impact – significant, yes, and for quite a few years, yes; but not a game-changer on longer-term fundamentals. on the oil graph why does the trend line start at a low of 20 when the oil price was at its peak $170 in 1980? Energy saving – I spent £100 on insulation with a payback of one year (1:1) and fitted £12K solar panels with a life of 25 years and a highly subsided (45p/unit v 11p current price) payback of 12 years (12:1), so probably will take the entire 25year life to recoup the true cost. Energy saving seems to offer great scope. Yet UK gov have watered down long term benefits of energy saving so much in the quest for the short term expedient of needing to build more houses. I guess that is what happens when you leave long term infrastructure planning to 5yr ‘here today, gone tomorrow’ parliaments. With the chart, I should perhaps have explained this in the text. The chart isn’t oil prices alone, but energy prices generally, adjusted to constant values, and then indexed to 2014 = 100. The 170 reading for 1980 simply means that real energy prices were 70% higher in 1980 than in 2014. The oil price at 2014 values was in fact $106/b in 1980. It regained that level in 2008, and exceeded it in 2011 and 2012. The underlying trend is based on factors unrelated to market prices, such as costs of extraction. Market volatility in energy is enormous. The oil price (again in 2014 dollars) soared from $11/b in 1970 to $56/b in 1974 (first oil crisis) and $106/b in 1980 (second oil crisis), i.e. almost 10x higher over ten years.. It then fell back to $18.50 in 1998, then rose to a peak of $117/b in 2011. The highest ever price for oil was actually 1864 (!) when the US Civil War pushed it up to $122/b. The point is that market prices, even for extended periods, can be quite different from the underlying trend, the latter reflecting more gradual trends such as technology, depletion and so on. I hope that helps clarify? On solar, the longevity and payback question is indeed complicated and confusing, particularly when the state gets involved with subsidies, carbon taxes and so on. I’m not sure what you mean about house-building, though, as we need to be building 250,000 units a year in England just to keep up with demand, but are managing barely half of that rate at the moment. Thanks Dr Morgan for another thought provoking read. I would say that the Uk economy and also that of the world is labouring under the burden of stifling political correctness that is skewing debate in favour of emotional not rational decision making. Holding a dangerously naive world view (The BBC with their aburd ‘Arab Spring’ nonsense) , not being ‘judgemental’ enforcing ‘equality of opportunity’ and attempting to eradicate world ‘poverty’ has driven the need for unaffordable borrowing in my view. Thoughts that are factually correct but considered politically incorrect are considered unacceptable leading to disastrous short-sighted decision making. Paying for the new ‘politically correct utopia’ has been massively expensive driving debt through the roof. The disastrous ‘Euro’ currency is a good example – essential a PC socialist device to ‘level the playing field’ transferring wealth from west to southern Europe. Notions of ‘thrift’ and ‘cutting ones cloth accordingly etc.’ are now considered un-fashionable and non PC. The mere mention of the word ‘cut’ has Mr Osborne requesting another huge chunk of borrowed phoney money. For all the talk about ‘austerity’ overall spending in cash and real terms continues to escalate..in the next 5 years he is going to spend more than every British government of the past 100 years put together. Why – because to cut spending by the amount needed to restore sanity to finances would be too politically incorrect. Dr Morgan rightly highlights resource depletion and spiralling energy costs – but why are resources being consumed so quickly ?. We are in an economic and political never never make believe land where we have become too short sighted and self centred to foresee the consequences of our actions. – Foreigners taking over British business is welcome ‘investment’. – The third world is entitled to the same standard of living as the western world. As the developed world has consumed much coal and oil, we cannot ask them not to do the same thing. – We must not be judgemental and condemn countries that have unsustainably high birth rates. It’s part of their culture. – Exporting our technology and industries to the developing world helps them and us in the long term. It’s also part of our ‘penance’ for past colonial behaviour. – Poverty is a relative concept based on average earnings not physical need. – In the Uk the unemployed are entirely blameless for their predicament and are entitled to a similar standard of living to those in work. – China and India are benign allies who can be trusted to build our nuclear power stations. To suggest that Chinese involvement might be less risky than utilising British Engineers who share our history and culture is racist. -The science behind climate change is ‘settled’. – It’s entirely rationale that we close down our coal fired power stations when Indonesia and China are opening a new one every week. Showing ‘leadership and ‘doing the right thing’ is more important than keeping the lights on.. Thank you. You will understand if I stick to the economic parts of the issue, where I think there is an ever growing need to choose priorities carefully. Priorities can go wrong when over-much attention is devoted to concerns promoted by pressure groups, including campaigns on social media. The BBC seems to me to have become a campaigning organisation on an agenda set by itself, and this risks losing public support – it would be far better to stick to neutrality, I think. Again, this sort of campaigning can distort spending priorities. Beyond this, one reason why the UK acts like its richer than it is may lie in the sheer scale of debt used to sustain the appearance of prosperity. The SEEDS reading for the UK economy is pretty stark, and might merit a discussion at some point. What I found particularly surprising about your article is the sharp drop in real GDP over the next 15 years….despite predictions of the UK population increasing by around 5 million over this period. If the population is set to increase at a time of diminishing output of globally marketable goods it must mean a severe downward pressure on standards of living ?. I read with interest Tim Price’s assesment of the economy – his conclusion was remarkably similar to yours…more worrying if you have both come to similar conclusions from different perspectives. Noo, look at the dates! That comment’s been drifting down until it found its rightful place! Don’t ya just love serendipity! Doh! I wonder if this is the beginning of my senility? Tim – I would be interested to hear what you think of uncle George’s latest magic trick. More hope than substance? Let’s stand back first and say “yes, more hope than substance”. But this is to be expected in politics – outcomes have been less good than expected, right back to 2010, and before that Gordon told us we were living in nirvana. So I think George’s numbers look pretty optimistic, but not dramatically more so than previous Chancellors. Obviously it’s the change to OBR fiscal forecasts that has enabled him to pull rabbits out of hats here. If a previous Chancellor, with no OBR to fall back on, had simply said “I’m expecting an an extra £23bn in revenues”, we’d still be laughing now – so the OBR forecast is where one needs to look. Within this, the forecast improvement does not come from an upgrade to growth projections, which overall are unchanged. I think they are way too optimistic – the current account projections seem way out to me – and the growth numbers seem, even by their own admission, to depend on households going ever deeper into debt. But George has to work with what he gets from the OBR. Part of the improvement is low interest rates for longer – well, maybe. But most of its is a higher tax take within existing taxes and rates. I can’t see the logic there, personally – (a) not a lot has really changed since July, and (b) recent data is far from encouraging. The OBR says it would not have been less bullish if it had seen the lousy October numbers before forecasting – again, “well maybe”. Given what the OBR handed him, he had no choice over tax credits, and not much choice over police or defence. Health deficits look like a runaway train – his extra money won’t be enough and we need complete reform (get rid of trusts and re-centralise, I believe), plus tighter criteria on what the NHS should and should not provide. Health shortfalls are going to be a running sore. I welcome the housing boost, but believe that we need more affordable rented property, and less obsession with ownership. The extra tax on BTL and 2nd homes is fair enough, given the property price windfall created by ZIRP and QE – he’s right to want something back. In the final analysis, it will depend on how accurate the OBR’s forecasts are – “not great” would be my guess, as their forecasting record is less than stellar. So debt will turn out bigger than forecast – no change there, then! Thanks for a prompt & thoughtful response! I’m surprised your not more critical of George Osborne…Gordon Brown took a great deal of (justified in my view) criticism in your Perfect Storm report. At least Gordon was deluded and thought he had really abolished boom and bust. George Osborne witnessing the 2007 crash has had a warning ..yet he has increased spending in cash and real terms borrowing more than Gordon did in just 5 years. The last spending review could have been written by Gordon Brown – both men pretty much spend as much as they can get away with. The link between spending, affordability and need is broken to be replaced with an intolerant doctrine of political correctness. ‘Our NHS’. ‘hardworking families’ and their blessed tax credits and foreign aid all have sacred cow status. This is the reality it seems of Osbrown economics. Is the OBR just a puppet of George Osborne ?. Making spending commitments based on the forecast of a treasury official with a poor track record of accuracy doesn’t seem very prudent to me. How can this be squared with the boast of ‘fixing the roof while the sun is shining’ . All organisation have bias but the OBR’s is just blatant in my view. You are right to point out that I was very critical of Gordon Brown, and I really cannot put George Osborne in the same bracket, even though I agree with you about the Autumn Statement. I thought Brown was a disaster. He actually believed that Britain was booming when all we were doing was riding a tide of debt. He spent public money like a sailor on first-night shore-leave. But it goes further than that. He scrapped pension fund dividend tax reliefs – a disaster. He weakened banking oversight with his tri-partite system – another disaster – and lectured foreigners on the virtues of “light touch” regulation. He and Blair dithered for more than a decade over nuclear replacement. George Osborne is the only post-War chancellor who has actually reduced public spending in real terms. It didn’t crash the economy, as critics predicted. He has made mistakes, of course. But he is in charge of an economy with far greater weaknesses than are generally realised. The UK economic mix is adverse, energy supply is deteriorating rapidly, the current account deficit is grave, and dependency on borrowing remains a serious weakness. He has ideological bias, of course, but is surely more pragmatic than Gordon. I’m not sure about the OBR and bias. I think it’s being over-optimistic in many areas, and not for the first time, but that’s not the same as bias. I think an independent OBR is a better planning basis than “the back of the Treasury’s fag-packet”. The economy is much weaker than is officially admitted, but I really cannot see how Brown, or even Darling, would have handled it better than Osborne. What somewhat depresses me is that those in charge are all “tinkerers” whereas what we actually need is a far more fundamental review of things like the NHS and the Welfare State, perhaps even on cross party lines. We spend huge sums on WTC and HB, sums which grow year by year, without asking the question why? The NHS is a sacred cow and shouldn’t be. Now I am not naive; I know these are large and difficult issues both economically and politically but no-one even raises these issues even in a mild form let alone indicates alternative approaches. It’s almost as if we need to go through a crisis before we can get any meaningful change, which is hardly the best way of proceeding. Thanks Dr Morgan for your thoughts. ‘Listening to some people about the Autumn Statement, it appears you don’t get much for £4 trillion these days. That’s the amount the government plans to spend in the five years of this current Parliament. They aim to increase total spending by 8.7%, comparing 2019-20 with 2015-16. That’s why we hear endless arguments about cuts and the drive to a smaller state! We heard all the same arguments between 2010 and 2015. At the end of the last Parliament public spending was higher in cash terms and in real terms than in 2010’. It’s hard to know the truth – perhaps Osborne briefly reduced public spending in real terms then put it back up again. I don’t have the figures to hand but it appears there has been no overall reduction in spending either in real or cash terms. If Osborne cannot cut spending now with an opposition party on it’s knees and a backdrop of a recent economic crash..when will he cut spending. Osborne is arguably more reckless than Brown…Brown wasn’t drinking in the ‘last chance saloon’. and had the resources for a bank bailout. Osborne has no such latitude..one big slip and we will all lose our shirts. Yes Osborne is slightly preferable to Brown ..but that’s like saying I would prefer to cut my hand of than my leg. I cannot see how the OBR’s analysis is demonstrably better than the old treasury forecasts. It’s predictions have been woefully misguided. How do we know it is truly independent and not riddled with group-thinkers and cliques that exploit it’s so called ‘independence’ in name only?. Part of this, I think, is complacency/ignorance over realities. The public believe what they are told about the economy – but you only need to look at debt, at foreign ownership of assets, or at the straitened circumstances of public services (which George has had to cut) to get the reality that we are not really all that wealthy. So the need to prioritise is not understood. Then of course there is ideology – fully competitive markets are ideal, but quasi-markets within the public services are not remotely the same thing. Finally there is public noise/pressure – govt over-reacts to petitions, social media and so on. My recipe for the NHS would be re-centralising, scrapping Trusts (and with them the whole of an expensive management tier), and concentrating on illness – I hate to say it, but things like infertility are undoubtedly misfortunes, but I’m not sure that they are actually illnesses. Being sort-of optimistic, reform will be forced on the NHS by finance – deficits seem to be doubling every six months, so choices will have to be made. I just hope it’s not yet more privatisation – I was all in favour of privatising Jaguar, oil etc, these should never have been in the public sector, but the public, rightly or wrongly, do not want private involvement in the NHS. Firstly, many thanks for your articles which I enjoy reading, although the contents are not too jolly! Since losing my shirt in the GFC i have tried to understand how I went from being a high net worth individual to zilch, by consuming as much data as possible. I have concluded that there is no political party known that would be able to keep spinning the plates forever, and that the UK economy is in a parlous state. My point really is that I feel more people are aware finally that all is not well with UK PLC, and indeed the global picture. My fear is that at some point in the next few years the plates will stop spinning and we shall have mass public disorder which I am sure this government must be planning for behind the scenes. You address two issues here – what the problems are, and how politicians tackle them. My view is that the UK economy has major problems, something that I may write about soon. This has to be seen within a faltering global economy. I think you are probably right, too, about public awareness of this. There is probably a lot of confusion about what the real state of the economy is. Political parties find this difficult to deal with, for various reasons. First, all parties have ideologies which can prevent them from acting wholly objectively – for example, neither the Blair/Brown government, or this one, would be likely to commit to a big programme of building council houses, despite the merits of such a project. Then, all parties are coalitions, whose leaders have to balance various interest groups. Third, public opinion is fickle, and politicians often think that social media and lobbyists speak for the public, which I very much doubt. I certainly hope that unrest can be avoided. I believe that reform is always better than something more explosive, but reform is hampered by all of the above, plus institutional inertia. Hello Dr Tim. Thanks for another thought provoking article. Do you any thoughts on the effects that money remittances from people working in the UK to families abroad may have on our economy. I am not sure I have ever seen any assessment of this. By now everyone must be aware of the large number of immigrants, both legal and illegal, who come to this country each year. The number of national insurance numbers issued to foreign born nationals in the 12 months to March 2015 can be found here http://bit.ly/1jxelRZ. The number is 824,000 and the total over 10 years must be 6 million. Consider the famous Polish builder that works here and sends money to his family. As do many foreign nationals working in this country. Is there any estimate of the scale of the money transfer as a percentage of GDP? What is the effect of the cash drain – good or bad, large or small, inflationary or deflationary? Good question, though so far as I’m aware no specific data is published on this. To explain, the current account divides into two broad categories – trade (last year, a deficit of £33.7bn) and other current flows (an outflow of £64.2bn, making a total deficit for 2014 of £97.9bn). The current flows are divided into “primary” and “secondary” income, and the remittances will be in there somewhere, but I haven’t seen them itsemised. In the overall scheme of things, I doubt if the number is material in relation to GDP. AThough net payments to the EU are included, the big stuff is returns on investment – that is, interest and dividends/profits, paid to (less received from) foreign investors. You have previously made a lot of the increasing current account deficit – I read some time recently (I think it may have been from David Smith) that some of this may be spurious and due to the way in which things were calculated. The example he gave was that profits from companies that had moved their headquarters offshore for tax reasons but maintained the bulk of their economic activity in the UK were unfairly counted as a negative flow. Is this likely to be the case? Thank you for this. I will look into it, given its seriousness. I’m looking at the UK now, because the impression given by headline numbers (such as growth of c.2.4%) is so starkly at variance with the SEE reading (essentially, SEE shows the UK as a basket-case, with consumption “growth”, which drives GDP, being actually nothing more than a function of borrowing). OBR forecasts show the current account narrowing, but also show debt rising more quickly than GDP – essentially, the OBR seems to assume that if government borrows less, households have to borrow more to keep the economy on track. Replying to your comment (Dec3rd – above) on UK growth. Agree that this is puzzling and as you say likely to be due to debt-fueled domestic consumption. A glance at the various lists of top-growing companies suggests that a large chunk (though not all) are retail or retail-related activities. Yes indeed. People take out 'loans' for a purpose and when banks extend credit to a customer the credit is spent into existence as money. And the 'borrower' is left with a debt that is 'repaid' to the bank with money earned from the borrower's economic output. But if the bank created the credit based on the borrower's promise to repay (money created ex nihilo), why on earth is the bank paid for what it did not have in the first place? "The process by which banks create money is so simple the mind is repelled." "Each and every time a bank makes a loan (or purchases securities), new bank credit is created — new deposits — brand new money." "The modern banking system manufactures money out of nothing. The process is perhaps the most astounding piece of sleight of hand that was ever invented. Banking was conceived in iniquity and born in sin. Bankers own the Earth. Take it away from them, but leave them the power to create money, and with the flick of the pen they will create enough money to buy it back again… "
Intrigued? Grab a cup of tea and settle down for 45 minutes and watch Paul Grignon's ‘Money as Debt’. He has produced 3 versions and all are available on DVD or can found on youtube. Most of the ideas in Grignon's work reflect what was written by Frederick Soddy FRS in 1925 in his book 'The Role of Money'. But as much as Soddy's book is lengthy turgid text, Grignon's is light and entertaining. I agree with Abraham Lincoln (but then again who am I – hah). Creating and issuing money should be the sole prerogative of the state. Just look at what the banks did in the years up to 2007 under fractional reserve banking – creating mortgage backed securities, etc and blowing up the financial system. Your thoughts, at some point, on 100% reserve banking would be welcome. You raise some very good points here. Back in February I published an article specifically about the nature of money, which produced a lively debate here – can I recommend you start with that article, which may address the issues you raise here? I am a follower of Our Finite World where someone referred to you and your article Perfect Storm which filled me with joy because for a long time I have come to the same conclusion as you: money is a claim of energy past, present, future (subservient role of money). However, I was never able to explain it clearly to Mrs. Gail Tverberg. But at last I asked her to see if energy consumption and money correlated in at way. And certainly both items correlate 99% with each other. In Denmark where I live no windmill or windmill park has ever been able to have an existence without heavy subventions. Often the subventions triple the value of the energy produced. I therefore claim that windmills are highly pollutant as the money for subventions eventually ends up in a consumption of coal and diesel as these energy types are the drivers behind all production.